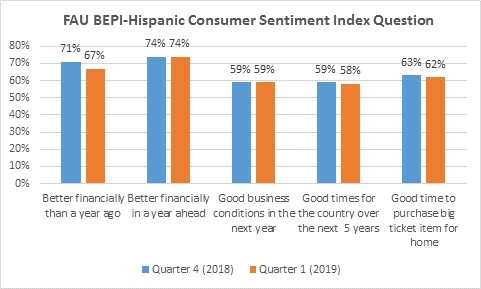 The Hispanic Consumer Sentiment Index (HCSI) in the first quarter of 2019 finds that the Hispanic population’s consumer confidence in the U.S. has slightly dropped compared to the fourth quarter of 2018. Specifically, the Hispanic Consumer Sentiment Index (HCSI) dropped from 98.5 in the fourth quarter of 2018 to a 96.6 in the first quarter of 2019. The HCSI is 2 points higher than the general population first quarter average of 94.5 as published by the University of Michigan. In the first quarter of 2019, only 67% of Hispanics said they are better off financially than a year ago compared to 71% in the last quarter of 2018.
o Men are more optimistic of their current financial situation compared to women (74% vs. 60%). o Hispanics between 18-34 year old (68%) and those between 35-54 year old (70%) are more optimistic of their current financial situation than those above 55 years old (60%). In the first quarter of 2019, 74% of Hispanics indicated they will be better off over the next year; which is roughly the same value as in the last quarter of 2018.
o Men are more optimistic of their future financial situation compared to women (78% vs. 70%). Independents and not registered voters (Democrats (68%), Independents (72%) and not registers (77%). Regarding the short run economic outlook of the country, 59% of Hispanics said they expect the country as a whole to experience good business conditions in the upcoming year; which is roughly the same value as in the fourth quarter of 2018.
economic outlook of the country than those above 55 years old (50%). o Hispanics that self-identified as Republicans (65%) are more optimistic of the short run economic outlook of the country compared to Democrats, Independents and not registered (Democrats (54%), Independents (59%) and not registered voters (60%). In terms of long run economic outlook of the country, Hispanics are slightly less optimistic in the first quarter compared to the fourth quarter of 2018 (58% vs. 59%). o Men are more optimistic of the long run economic outlook of the country compared to women (63% vs. 52%). o Hispanics that self-identified as Republicans (70%) are more optimistic of the long run economic outlook of the country compared to Democrats, Independents and not registered (Democrats (49%), Independents (63%) and not registered voters (51%). In the first quarter of 2019, 62% percent of Hispanics think it is good time to buy big ticket items compared to 63% percent in the fourth quarter of 2018.
o More men think it is good time to buy big ticket items compared to women (67% vs. 58%). o Hispanics between 18-34 year old (64%) and those between 35-54 year old (67%) are more optimistic that it is a good time to buy big ticket than those above 55 years old (47%). Cost of living: 71% of Hispanics said the cost of living has gone up, this an increase of 6 points compared to the fourth quarter of 2018 (65%). Buying a Car: Due to the perceptions of increase in the cost of living, only 61% of Hispanics think it is a good time to buy a car compared to 63% in the last quarter of 2018. President Trump approval rating: President Trump’s approval rating drops of 3 points from 40% in last quarter of 2018 to a 37% approval in the first quarter of 2019.
o Hispanics that self-identified as Republicans (63%) have a higher approval rating of President Trump’s performance compared to Democrats, Independents and not registered (Democrats (30%), Independents (29%) and not registered voters (21%). The poll is based on a panel sample of Hispanic adults, 18 years of age and older. The survey was administered using both landlines via IVR data collection and online data collection using Survey Sampling International SSI. There were 640 respondents sampled between January 1 and March 31, 2019 and a margin of error of +/- 3.87 percentage points. Responses for the entire sample were weighted to reflect the national distribution of the Hispanic population by region, education, gender, and age according to latest American Community Survey data.